We all have heroes. They are people who we perceive are somehow better than we are. We want to be like them. They provide for us a template of how we can feel happy and proud that we had a life on this earth. They are not perfect by any means, but they have particular characteristics that we want to combine and emulate….We take the pieces and ask the question, often without knowing it: how can I come closer to each of their strengths and avoid each of their weaknesses? Without sacrificing our concept of self, the templates of our heroes can help us know, concretely, where we want to go. Whether we admit it or not, knowing where we want to go is always the first step in a journey. Do you know who you want to be as a school? Who are your school heroes? Your educational heroes? Your learning heroes? Do you know where you want to go on your journey to become a better school? Are you constructing detailed plans to decipher and determine your paths as a school community? Grant Lichtman spent his week in Denver, CO. He shared time, stories, and practices with four different schools. Lessons from these examples can help us know better who we are as a learning community. Lessons from Grant’s travels can reveal the school heroes we want to emulate. What form of leadership will you employ at your school? In what ways will you facilitate students interacting with the “real world?” How might you experiment with various methods and approaches? 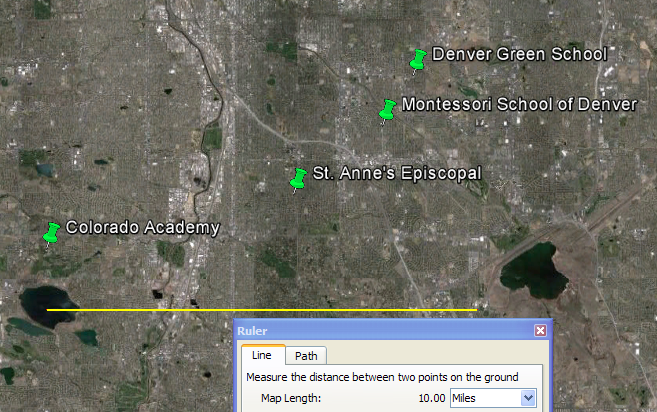 Grant’s waypoints in Denver can provide great touchstones on which to reflect and plan your own journey. Image from Google Earth courtesy of Steve Goldberg (@SteveG_TLC). This entry was posted in Grant Lichtman's #EdJourney and tagged Colorado Academy, Denver, Denver Green School, EdJourney, Grant Lichtman, Montessori School of Denver, St. Anne's Episcopal School by boadams1. Bookmark the permalink.